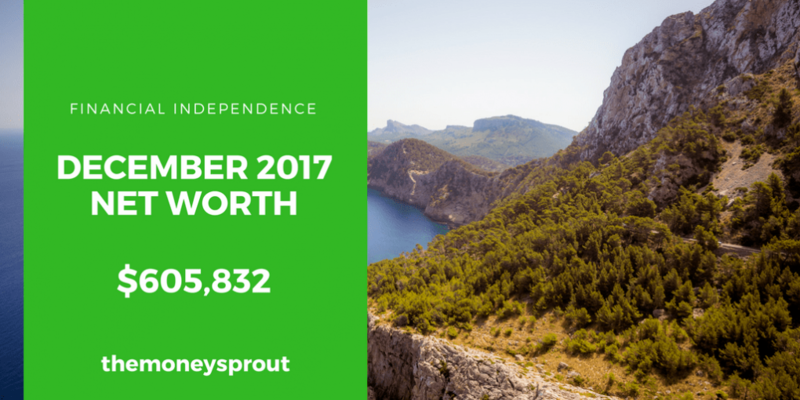 We have been tracking our net worth and posting updates here on The Money Sprout for almost 3 years now. In that time, there has only been one instance that our net worth has dropped … which is awesome! Based on our net worth history then, it should be no surprise that in December … we are reporting another huge increase (compared to November). With this latest increase, we continued our streak of positive increases to our net worth every single month in 2017! For the 12th consecutive month (starting in January of this year) … we have grown our net worth. Even better … since our first report back in March 2015, we have grown our net worth by 39.3%! That is an increase of over $170,000 in just 2.75 years. It is an awesome feeling knowing we are growing our net worth by thousands and thousands of dollars every single year! So how did we do this December? As of December 31st, 2017 – our net worth is $605,832! Here is our most recent update, compared to our last net worth post in November. Our net worth in December 2017 increased by a modest 2.35% compared to November (2017). That is an increase of almost $14,000 in 1 month. WOW! Once again, this past month saw another big increase in the stock market … which gave our investments an awesome boost. Lately, we have been putting more new investment dollars to work in bonds to try and even things out. That way, if the market crashes, we can transfer our bond investments back into stocks. The value of our investments increased by an incredible 3.27% last month! We have a bunch of large expenses due after December (see credit card liabilities below) … so our cash balance increased by over $3,000 last month. We need to be prepared to pay off these expenses on our credit cards, and this extra cash will help. A nice jump in home value compared to last month … but we need to remember it is just a estimate. All 3 of our major asset classes saw increases. Investments (as usual) really helped to push our net worth higher this past month and our cash saw a big jump too. Our home value increased as well … but I just don’t get as excited about that as the other two categories. Total assets rose by 0.69% since last reporting. We accidentally made two mortgage payments in November, so we didn’t pay one in December. This allowed our cash balance to increase in order to pay for other upcoming bills. At the start of the year (January 2017), we took on a lot more debt after buying a second car … which I will refer to as “car loan #2”. My 16+ year old vehicle finally died, so I needed reliable transportation. Our credit card balances fluctuate a lot month to month. However, this past month we took on over $7,000 more of credit card debt. The good news is that $4,000 of that debt is our property taxes. The remainder is from Christmas spending and a Disney trip we recently took. Normally, we don’t let our credit card spending get this high … but we just had a lot of expenses come due all at once. The good news is all those expenses have helped us max out 3 travel rewards cards! Since last reporting, our mortgage balance has remained the same – as expected. We also saw a great big drop in our car loan debt. Our credit card spending more than doubled the past month, which was due to many expenses hitting us at the end of the year. Most notably, our property taxes were due and totaled almost $4,000. Collectively our total liabilities increased by over $6,000. Normally this would be upsetting … but knowing we had some larger credit card bills eased any worry. After reviewing our net worth number for this December, most of our gains came from our investments and a little bit from home value and cash increases. Liabilities increased a good amount … but should turn around the next couple of months. And we will continue paying extra on our car loan #1 payment, so that we can eliminate that debt in another year and then focus on paying off car loan #2. Overall, it has been a fantastic year with our net worth climbing by over $94,000 since last January! A lot of that growth came from the stock market, but our net worth has increased by 18.40% the past year!